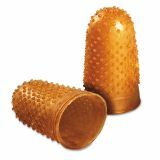 Swingline Rubber Finger Tips, 11 1/2 (Medium), Amber, Dozen - Swingline Parr Rubber Fingertips provide a solid grip for handling mailroom activities, envelopes and paper filing. Deluxe-grade rubber ensures a long life and a strong grip, reinforced by surface nubs that clutch the paper. Every tip includes additional reinforcement for longer use. 12 per pack.